On October 4, 1996, the Honorable Sandra Day O’Connor, associate justice of the Supreme Court of the United States, received the Henry Clay Medallion from the Henry Clay Memorial Foundation in Lexington. Justice O’Connor now serves as a National Advisor to the Henry Clay Center for Statesmanship. Previous medallion recipients include former Speaker of the House Thomas S. Foley and historian Thomas D. Clark. Justice O’Connor offered the following remarks at a dinner in her honor at the Governor’s Mansion in Frankfort, Kentucky. I am so happy to be here to talk with you about Henry Clay, a man who has had an incredible impact upon the history of our nation. In his fifty years of public service, Clay served as a congressman, a diplomat, and a senator – and that is just the tip of the iceberg. Clay himself is said to have remarked, “Sir, I would rather be right than be President.” As I look back over his long and distinguished career, I am struck by the observation that Clay did just about everything there is to do in Washington except be president. When I think of Henry Clay, I am reminded of occasional visits to a lake in my youth. We have probably all tried our luck “skipping” flat stones across the surface of a pond or lake. With luck, a stone will skip along the water five or six times, creating rings of concentric circles that ripple out across the water long after the stone itself sinks below the surface. But soon the water surface returns to its original state – no better and no worse for the assault by the stone. Indeed, there is a poem that is relevant. Put your hand in it up to the wrist. Henry Clay is a person who defies the message of the poem. He was certainly an indispensable man. His career skipped across the entire surface of American political waters, and we still feel the ripples of his actions today. Following two brief appointed terms in the U.S. Senate, Clay’s career in national politics effectively touched down first in the House of Representatives, where he was elected Speaker in 1811 by a two-to-one margin at his first session. Before Clay’s tenure, the Speaker’s duties were largely ministerial and had little influence over the course of House politics. Clay, however, used his position as Speaker to appoint committee chairs who saw eye-to-eye with him and who would implement his political agenda. Thus, Clay was largely responsible for increasing the responsibilities – and the accompanying – power of the position of Speaker of the House. Nor did the Kentuckian let this influence go to waste. As one of the so-called War Hawks, Clay pressured President James Madison to take a stand against Britain, whose forces had conscripted American seamen and had armed the Indian tribes along the American frontier. Clay’s pressure on the President led in large measure to the War of 1812. That conflict, in turn, resoundingly established America’s independence from Britain. It also gave Andrew Jackson the chance to make a name for himself. (Jackson, of course, later defeated Clay in Clay’s second bid for the presidency.) Not only was Clay instrumental in starting the war, he also played a hand in ending it, serving as one of the five delegates appointed by Madison to negotiate the peace treaty with Britain at Ghent, Belgium. As Speaker of the House, Clay also used his influence to push through Congress the Missouri Compromise of 1820, which postponed for many years the confrontation on the issue of slavery in the territories. In 1825, Clay moved from the legislative to the executive branch of the government to serve as secretary of state under President John Quincy Adams. As secretary, Clay was responsible for drafting the instructions for the American delegates dispatched to Panama for the Pan-American Conference in 1826. These instructions advocated “equality of commercial privileges” between the countries of the Western Hemisphere, disparaged the formation of Latin American monarchies, and encouraged the construction of a canal across the Panama isthmus. Unfortunately, the Pan-American Conference adjourned before the American delegates arrived! Nevertheless, Clay later considered these instructions to be one of his greatest accomplishments while in the president’s cabinet. In 1831, Clay moved back to the Congress as a senator. It is here that the repercussions of Clay’s actions are most evident, as he more than once helped to avert confrontations that might have precipitated the Civil War at a time when the Union was not strong enough to withstand the secession of the Southern states. The first confrontation arose in 1833, in response to the Tariff Acts of 1828 and 1832. The tariffs protected the manufacturing industries of the northern and western states by assessing taxes on imported products; the tariff-inflated prices of the imported goods made it easier for the American manufacturers to compete in the marketplace, since their products were inexpensive when compared to the imported goods. However, the tariffs sparked the countries that exported goods to the United States to impose tariffs of their own on American exports. Thus, the tariffs that aided the infant manufacturing industries, at the same time harmed the established exporters of tobacco and cotton in the South. Senator John C. Calhoun of South Carolina argued that the tariffs were unconstitutional and that individual states had the power to “nullify,” or ignore, unconstitutional federal laws. President Andrew Jackson vigorously disagreed and threatened that he would not tolerate state nullification and would suppress it, by force if necessary. Into this tense situation stepped Henry Clay. Although he believed in the need for a strong protective tariff, Clay introduced the Compromise Tariff of 1833, which gradually decreased the tariff rate. His mediation mollified both Jackson and Calhoun and averted the need for Jackson to resort to force. Nearly twenty years later, Clay helped avert the crisis over the admission of California into the Union. California sought admission as a free state – or a state without slavery – which would have upset the delicate balance of power in Congress between free states and slave states. The Southern states vehemently opposed California’s admission, while the Northern states argued that California should have the right to enter the Union as a free state if it so desired. Once again, Clay emerged as the agent of compromise. He introduced and promoted an omnibus bill that covered the admission of California, the settlement of Texas’s boundary fine, the fugitive slave law, the abolition of the slave trade in the District of Columbia, and the recognition of the principle of popular sovereignty in territory acquired from Mexico. Although Clay’s omnibus bill ultimately failed, Senator Stephen A. Douglas proposed – and Congress enacted – five separate bills that accomplished the same goals. Even Douglas acknowledged that his separate bills would be “collectively Mr[.] Clay’s compromise.” Thus, the Compromise of 1850 came to be. The accomplishments I have mentioned are the ones that earned Clay the titles for which he is most well known – as a “War Hawk” in his youth and as “The Great Compromiser” in his middle and later years. But a closer look at Clay’s career reveals that he played a part in influencing another branch of the American government particularly important to me, the Supreme Court. In one respect, I should not have been surprised. Clay was, after all, a lawyer. Before his admission to the Virginia bar, Clay studied law under George Wythe, who had also trained John Marshall. Having the same teacher as one of the greatest United States chief justices could not have hurt Clay’s chances at making his mark there. And Clay used his training to his advantage. He practiced briefly with Robert Brooke, a former Virginia governor, before heading through the Cumberland Gap to hang out his shingle in Lexington, Kentucky. 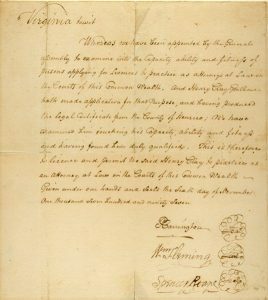 Henry Clay’s law license issued by the State of Virginia on November 6, 1797. this copy is in the HCMF Henry Clay family Papers at the University of Kentucky. While in Kentucky, Clay twice represented his friend Aaron Burr before a grand jury. In 1806, Attorney General Joseph Daveiss sought a subpoena to compel Burr to appear before a grand jury. Daveiss claimed that Burr had attempted to instigate war against the Spanish by organizing an attack against Mexico and the Floridas. Upon learning of Daveiss’ actions, Burr immediately called upon Clay to represent him. Although the judge had already denied Daveiss’s request for a subpoena, Clay strode into the courtroom and persuaded the judge to impanel a grand jury and then to dismiss the jury when Daveiss could not provide evidence to substantiate his claims. When Daveiss asked the judge for a second subpoena, Burr once again turned to Clay. By this time, however, Clay had been elected by the Kentucky legislature to serve out an unexpired term in the U.S. Senate. Clay expressed doubts about whether representing Burr might create a conflict of interest. Clay only agreed to represent Burr after Burr had written a letter assuring Clay that he was innocent of the charges. This time, the grand jury heard evidence but refused to indict Burr. Some of the cases Clay argued continue to be cited as precedent today. In Osborn v. United States [34 U.S. 573 (1824)], Clay argued on behalf of the Bank of the United States, which was a nationwide bank chartered by Congress. Clay challenged the constitutionality of an Ohio tax levied upon the bank and sought an injunction to force the state’s auditor to return the improperly seized taxes. The Supreme Court agreed with Clay and ordered the auditor to return the taxes. In doing so, the Court found that the Eleventh Amendment – which bars lawsuits against the states – did not apply to the state auditor. Osborn is still relevant today: It has been cited twenty six times since I took the bench in 1981, and was cited just last term by Justice David Souter in a dissent. [See Seminole Tribe.] Nor is Osborn the only case argued by Clay to be cited in recent times. Clay also argued on behalf of a Kentucky creditor who sought to collect a debt from a person who declared bankruptcy under New York law. In that case, Ogden v. Saunders [25 U.S. 213 (1827)], the Court concluded that the New York bankruptcy law was constitutional, so that the debtor was no longer liable to the Kentucky creditor. The case has been cited 86 times since it was decided, three times since I came on the bench. Other cases Clay argued are just as important for what they did not decide. For example, in Groves v. Slaughter [40 U.S. 449 (1841)], a Mississippi resident bought slaves from a trader but refused to pay him. The resident claimed that Mississippi’s constitution prohibited ‘ all slave trading after May 1, 1833, and that he had purchased the slaves after that date. The Mississippi constitution, he concluded, rendered the trader’s claim unenforceable. Clay disagreed with the resident, claiming that the state constitutional provision at issue lacked the force of law until the Mississippi legislature enacted implementing legislation. The Supreme Court agreed with Clay. What I find most interesting about this case is what the Court did not decide. The Court did not hold that slaves were property that could be transported and traded in any state or territory without regard to an individual state’s constitutional provisions. In fact, this is what the Court would decide sixteen years later in the infamous Dred Scott decision, a decision that is thought to have hastened the Civil War. By not reaching this issue in Groves, the Court provided the nation with a reprieve from the consequences of its unhappy decision in Dred Scott. Clay’s advocacy before the Court also launched a new chapter in the Court’s decision-making process in Green v. Biddle [21 U.S. 1 (1823)]. When Green, a Kentucky landowner, sued to remove Biddle, a trespasser, from his land, Biddle invoked two Kentucky laws that would have required Green to pay Biddle for certain improvements he had made to the land. Green responded that the state laws were unconstitutional. Green noted that under an interstate compact between Kentucky and Virginia, the Bluegrass State had promised to follow Virginia land law. Virginia land law did not give trespassers like Biddle the right to compensation for improvements; Green claimed that the Kentucky laws invoked by Biddle conflicted with Virginia law and were therefore unconstitutional. Biddle’s attorneys did not appear to argue his case, and the Supreme Court found in Green’s favor. Henry Clay, as amicus curiae – which is Latin for “friend of the Court” – asked the Supreme Court to rehear the case so that Biddle could have his day in court. The Supreme Court granted Clay’s request. On Biddle’s behalf, Clay argued that Virginia could not dictate which laws Kentucky enacted and that the Kentucky laws were therefore constitutional. In a split decision the Court reaffirmed its original decision and again struck down the Kentucky laws. This passage, extracted from one of Henry Clay’s own Supreme Court case report books, describes the first Amcius brief which he filed. Even though he did not prevail in Green v. Biddle, Clay was the very first person to appear as amicus curiae before the Supreme Court. Such “friends of the Court” appear in most of the cases our Court hears today, although they no longer ask the Court to rehear cases. The “friends” who appear today usually file briefs calling our attention to points of law, policy considerations, or other points of view that the parties themselves have not discussed. These amicus briefs invaluably aid our decision-making process and often influence either the result or the reasoning of our opinions. As a result of his appearance in Green, Clay was largely responsible for inaugurating an institution that has since shaped much of this Court’s jurisprudence. Yet, Henry Clay’s contributions to the Supreme Court ripple far beyond his skills as an advocate. As a senator, Clay had a great influence in selecting the Court’s personnel. In 1836, Clay fought strenuously to have the Senate reject President Jackson’s nomination of Roger Taney for the position of chief justice. Taney and Clay had clashed a few years earlier. In 1833, Jackson had ordered his Secretary of the Treasury, Wilham Duane, to withdraw the government deposits from the Bank of the United States in the hope that the bank would collapse without the government monies. When Duane refused to follow Jackson’s orders, the president fired him and appointed Taney to the position. Taney carried out Jackson’s wishes without question. Clay, a strong advocate of the bank, was so incensed by Jackson’s – and Taney’s actions – that he persuaded the Senate to enter into its official journal a censure of Jackson. Clay’s ire over this incident carried over into Taney’s confirmation hearings but did not prevent the nominee’s confirmation. Two decades later Taney would pen the Dred Scott decision.Despite his failure to keep Taney from the Court, Clay’s influence over the confirmation process was very strong. After Clay lost the Whig Party presidential nomination to William Henry Harrison in 1840, he was relieved to see Harrison prevail over Martin Van Buren and the Whigs gain control of the White House. The victory was short-lived, however, once Vice-President John Tyler ascended to the presidency following Harrison’s death. Tyler’s repeated vetoes of congressional attempts to charter a national bank effectively alienated him from the Whigs. So disgusted was Clay by Tyler’s actions that he resigned from the Senate in 1842. Clay’s absence, however, did not prevent the Senate from blocking Tyler’s efforts to fill four out of the five Supreme Court vacancies that arose during his presidency. Clay also came close to serving as an associate justice. On August 25, 1828, while President Adams was in the midst of a bitter presidential campaign against Andrew Jackson, Justice Robert Trimble died. In an effort to fill the position while he still had the authority to do so, Adams first offered it to Charles Hammond, an Ohio lawyer. When Hammond declined, Adams turned to Clay. Clay also declined and urged Adams to nominate his long-time friend and fellow Kentuckian John J. Crittenden for the position. In the ensuing months, Crittenden became a pawn in the political battle between Jackson and Adams; the Jacksonians in Congress managed to table Crittenden’s confirmation until the presidential election. When Jackson won, Crittenden lost all chance of confirmation. It is difficult to say whether Clay declined Adams’s offer because he feared his nomination might reach the same fate as Crittenden’s or whether he felt he had other ambitions to pursue. In either case, Henry Clay never became Justice Clay. But that is not to say that Clay’s personality, or his name, did not have a profound impact on presidents, members of this Court, or their ancestors. Abraham Lincoln was one of Clay’s greatest admirers. The young Lincoln campaigned for Clay during Clay’s second bid for the presidency in 1832. Lincoln’s respect for Clay lasted long after Clay’s death in 1852. During the summer of 1858, when Lincoln campaigned against and debated with Stephen Douglas in a race for the Senate, Lincoln described Clay as his “beau-ideal of a statesman.” Justice John Marshall Harlan also deeply respected Clay. Justice Harlan served on the Court nearly forty years, from 1877 until his death in 1911. The Kentuckian is best known for his dissent in Plessy v. Ferguson, where he stated that “our Constitution is color-blind.” Justice Harlan’s father was one of Clay’s best friends, and justice Harlan named one of his sons after Clay. Even my own family tree is not immune from Clay’s powerful influence. My grandfather was born in Vermont in 1844. His name? Henry Clay Day. Given all of these accomplishments and accolades, Clay’s career truly did dance across the waters of American history, and the impacts he made in the institutions he touched were many and profound. Their ripples are still felt today. During his last term as a senator, just two years before his death in 1852, Clay said: “The Constitution of the United States was made not merely for the generation that then existed, but for posterity-unlimited, undefined, endless, perpetual posterity.” Henry Clay did not act solely for his generation. Without Henry Clay there might not have been any amicus appearances in the United States, nor a Compromise Tariff, nor a Compromise of 1850; the Civil War might have started earlier and the outcome of that war might have been different. Henry Clay acted for posterity’s sake. And for that, I am grateful.